See why Testo-equipped technicians are key to better air conditioning and refrigeration unit maintenance. Australians are no strangers to the heat – but forecasted temperature increases nationwide will soon bring tougher challenges than ever. The Australian Institute's HeatWatch program claims the annual average number of days over 35 degrees Celsius in locations such as Gold Coast and Western Sydney will increase over the next 75 years. As the temperature rises now and we head into hotter and hotter summers, it's clear air conditioning and refrigeration technicians need industry-leading instruments. This will help to ensure equipment in various commercial applications functions to a high standard. Why are air conditioning technicians key to a cooler future? The air conditioning installation, maintenance and repair sector is worth $8 billion, according to IBISWorld research. Meanwhile, the same source shows cold storage and refrigeration contributes over $6 billion in revenue annually to the Australian economy. This is because, in a country where temperatures regularly exceed 30 degrees Celsius during summer months, maintaining cool climatic conditions is vital in numerous industries. From commercial offices to warehousing, air conditioning and refrigeration is important for a comfortable indoor environment. This is reflected in the sector's employment figures – there were nearly 26,000 air conditioning and refrigeration technicians nationwide in 2017, according to the Australian Industry and Skills Committee. This is a more than 30 per cent increase on employment in 2015, showing the growing interest in this career path. But effective maintenance is only possible through using the best digital testing gauges available. Testo's 550 Refrigeration Gauge is the ideal instrument for analysing air conditioning equipment. The Guage displays superheat and sub-cooling data for up to 60 automatically logged refrigerants. It's also capable of simultaneously measuring high/low side pressures and temperatures, making it the perfect tool for any job or air conditioning and refrigeration unit. Additionally, the solution is linkable through the free Testo app, opening up a new range of possibilities for efficient data recording, processing and documentation. These features make the testo 550 Refrigeration Gauge the ideal instrument for automatically calculating all relevant temperature parameters, making anaylsing the equipment in questions easier. The testo 550 Refrigeration Gauge can store 60 different refrigerants. The testo 557 boasts many of the testing capabilities of other refrigeration gauges, including 60 stored refrigerant profiles and a user menu designed for seamless ease-of-use. However, the instrument adds an external vacuum probe to make system evacuation easier. This means technicians can dehydrate the refrigeration system quickly and easily for more accurate testing in less time than with analogue solutions. On top of this primary feature, Testo's 557 also comprises two NTC temperature clamp probes and a digital manifold linking the instrument with a smartphone-enabled app, connected via Bluetooth. Technicians can access and share data seamlessly in report form, even while performing other tasks. 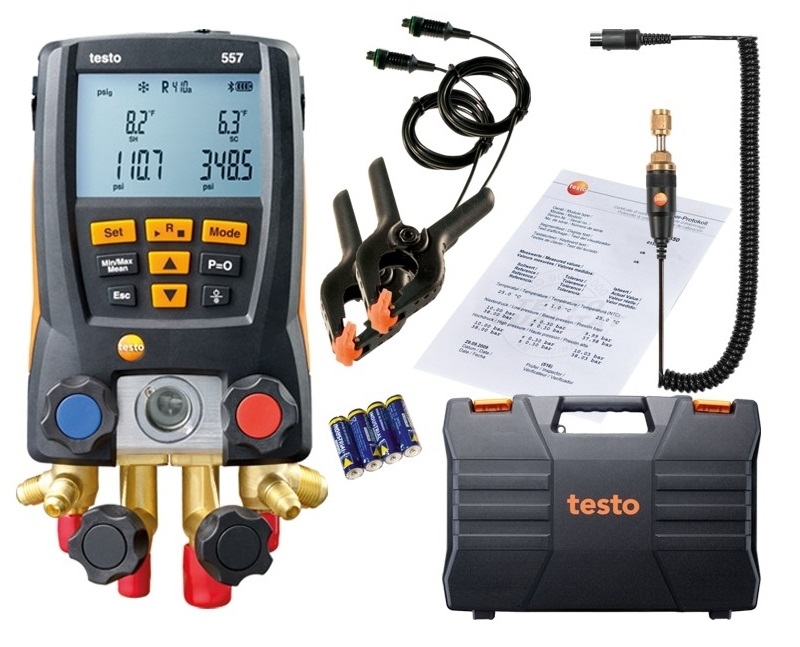 The Testo 557 offers a complete testing kit for air conditioning and refrigeration units. Ready to better equip yourself with the best? 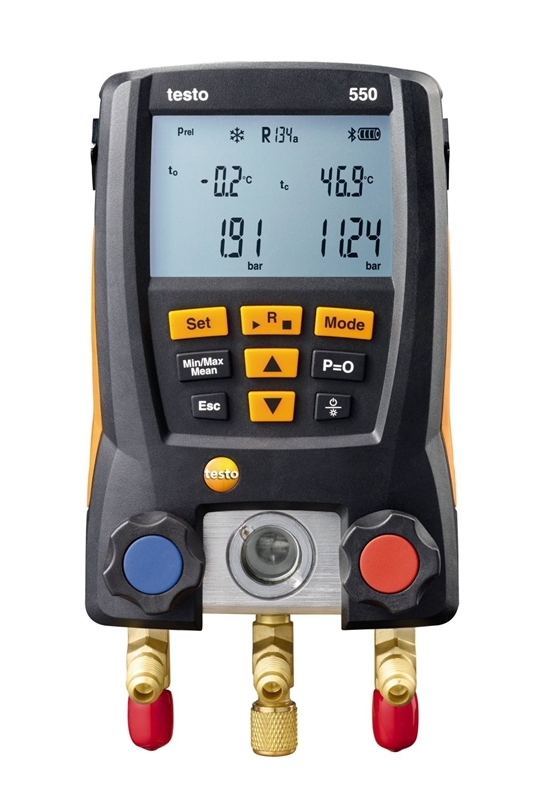 Testo's 550 Refrigeration Gauge and the testo 557 Gauge with Vacuum Probe offer technicians easier, more intuitive and advanced solutions for air conditioner and refrigeration equipment testing than ever before. Using these instruments, experts can gather rich insight into the functionality of commercial equipment and collate data into reliable service reports. This ensures organisations maintain safe and comfortable indoor conditions, no matter the temperatures outside. For more information on Testo's gauges, contact the team today.